If you want to make sense of electric symbols on your blueprints then you’ve come to the right place. The placement of the outlets for all the electrical items in your home can have a significant impact on the design of your home. 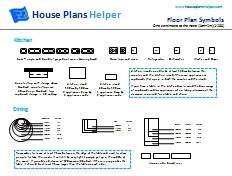 If you'd like a free pdf of all the blueprint and floor plan symbols go ahead and sign up below. Most of the electrical symbols used on blueprints have become standard. Some architects or designers may use slightly different symbols. Always check with the key on your blueprints. 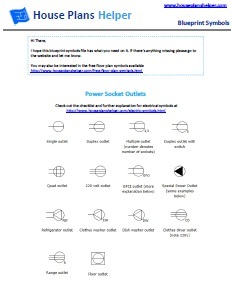 You’ll notice that some of the symbols have a subscript (that small writing at the bottom of the symbol) that helps explain what the outlet is for. You might some across a symbol with a subscript that isn’t explained here. If so, it should be explained somewhere in the key of the blueprint. All the outlets refer to wall outlets unless they are contained in square which means they're floor outlets. Tip for mobile browsers - these tables are best viewed with your phone in landscape position. GFCI stands for Ground Fault Circuit Interrupter - or circuit breaker for short. These outlets are required in places with water - so that's bathrooms and kitchens and maybe outside - especially near a swimming pool. It's so that if you drop your hairdryer in the bath you won't electrocute anyone! General outlets are where a wire is required to power a fixture where the fixture will be wired in rather than plugged in. The small horizontal line on the left of the circle indicates that the outlet is wall mounted. A circle without the horizontal line indicates that the outlet is mounted in the ceiling. Make sure you’re happy with the location of outlets – check against your planned furniture layouts. Make sure they're specified at the right height. Are you happy with the location of the main fuse box? Is it accessible? Because the last thing you want is to be struggling with a torch and ladder if a fuse blows.